No Fenders -Formula 1, IndyCar and A Whole lot more..: Caterham's sluggish Death-knoll almost complete, while Marussia set to emerge from Life-support? Caterham's sluggish Death-knoll almost complete, while Marussia set to emerge from Life-support? 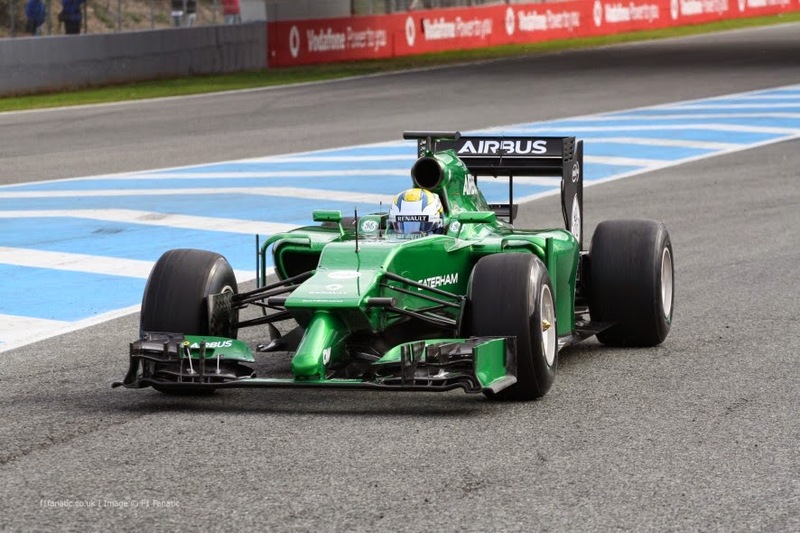 Although I suppose it shouldn't come as a surprise, it appears that the green cars of Caterham slogging round the tail end of Grand Prix's is a fleeting memory at best, as the Leefield based F1 Constructor is set to become no more with the announcement of the remaining squad's assets to go on the auction block shortly. Meanwhile there seems to be conflicting reports over rival minnow back-marker Marussia's existence upon the 2015 Formula 1 grid, with reports first extolling Marussia's planned exit us from bankruptcy via formalizing Company Voluntary Agreement (CVA) proceedings set to commence on Feb 19th. Yet, understandably, although somewhat petty, rival Force India, eternally in financial turmoil itself, quickly put the Kybosh on Marussia's return by voting Nyet! On plans to allow the team to run its 2014 MR03 chassis under special dispensation, which the stupendous Working Group had previously granted to both Marussia and Caterham. Although I haven't been able to ascertain when the Technical Regulations were changed in regards of not being allowed to campaign year old chassis, I simply don't understand why this dismal attitude prevails? recall that the mighty Prancing Horse, aka Scuderia Ferrari ran its blistering quick 2002 chassis for the first four races of the '03 season before introducing that year's successor, the F2003GA. While how can we forget "Super Best Friends" miraculous beginnings? When the hastily convened Honda 'B-team under Aguri Suzuki's leadership cobbled together its SA05 from the four year old dormant Arrows A23 chassis that had been on Show-car duty! Yet in the face of Marussia's impending demise, which would be revived as Manor Grand Prix, CEO Graham Logan says that the team is still plowing ahead and that the 2014 chassis can indeed be modified to meet the minimum 2015 standards required while meeting all safety requirements, although the largest hurdle is the team's apparent lack of a power unit and drivetrain, as I've read some wild ARSE speculation that MAGS JR' (Kevin Magnussen) could be farmed out to run essentially a Honda 'B-team, which would be beneficial for the Japanese manufacturer data-wise, but I'm pretty sure Hondre's firm on only supplying McLaren in 2015, albeit this would be a logical next step for 2016, just sayin', whilst keep in mind, F1 Constructors are allowed to miss up to three Grand Prix's per season, so the door's still open for Manor, provided it can field "2015-spec" chassis by the Bahrain Grand Prix in April, the fourth race of the year. 2014: The Year IndyCar Blogging Died?